Zhou Xun: Absolute Love ! When the producer André Morgan proposed making a movie musical in 2003, indie filmmaker Peter Chan was less than receptive. "I thought there was a reason no one had made a musical for 35 years," says Chan. "Audiences wouldn't go to them." But the lure of shooting in mainland China for the first time was enticing, and Chan saw an opportunity to make a modern musical without compromising dramatic complexity. With Morgan, the producer behind Oscar-winning Million Dollar Baby, and a $10 million budget, Chan assembled a starry cast: Taiwanese-Japanese icon Takeshi Kaneshiro, rising mainland actress Zhou Xun and Jacky Cheung, the one Heavenly King of Canto-pop who can really sing. But would audiences accept a big-budget Asian film without a flying kick or aerial swordfight? And was Chan—a Hong Konger best known for delicate, tightly-observed dramas such as Comrades, Almost a Love Story—the man to bring this improbable project off? Let there be no doubt: Perhaps Love is absolutely wonderful. Chan's film brims with pop energy, without sacrificing emotional punch. He creates real characters we care about, then lets them sing, dance and break each other's hearts. Yet he lavishes as much attention on stillness as on sound. And while Perhaps Love has an Asian feel, its production values match those of any international film. The result is dazzling proof that Chinese cinema will no longer be confined to the twin ghettos of martial arts and art house. 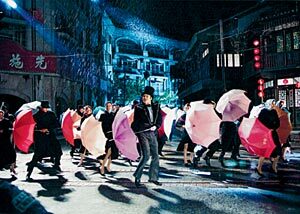 Modern audiences are bound to be suspicious of any film in which actors break out in song, but Chan avoids cheesiness by embedding the musical scenes in a movie being shot inside his movie. Arty director Nie Wen (Cheung) is making a blockbuster musical in Shanghai, starring his longtime lover Sun Na (Zhou) and a hot Hong Kong idol, Lin Jian-dong (Kaneshiro). Nie's musical is set in a Chinese circus, which allows Chan to use acrobats, contortionists, fire-breathers, trapeze artists, clowns and dwarves to liven up the dance numbers. But the musical inside the movie is just a shadow play for the complex drama behind the scenes. Sun and Lin were lovers 10 years before. Lin has grown obsessed with her over the years; Sun, who left him to find a career as an actress, wants the past demolished. But as filming sputters, Lin keeps pulling her back—until Nie notices he's losing his lead actress and his love. Chan deftly switches between the pulsing musical scenes, the growing tension among the cast in Shanghai and lengthy flashbacks to Sun and Lin's love affair in Beijing. The songs have a sense of the subcontinent, courtesy of top Indian choreographer Farah Khan, who taught the Chinese cast how to use their hips and added a few Bollywood dancers to round out the action. Two of Asia's best cinematographers—Peter Pau and Christopher Doyle—split time behind the camera, and each creates distinct visuals. Pau shoots the baroque hotels and classic Bund streets of Shanghai with a warm and romantic eye, all burnished greens, blues and browns. Doyle, Wong Kar-wai's longtime collaborator, gives Sun and Lin's flashbacks a gray, wintry look, as if we're peering through a window on which memory has accumulated like ice. The melodies in the musical may range from fair to forgettable and neither Zhou nor Kaneshiro have Broadway-class voices—though Cheung compensates—but you could hang Perhaps Love in an art gallery. Musicals usually swim in the shallow end of the genre pool, but Chan's film borders on the subversive—there are no fairy-tale endings, and no character escapes unscathed. That may challenge audiences in Asia and beyond, but Perhaps Love deserves as wide a following as it can find, not least because it's a harbinger of a time when the global movie industry will be increasingly driven by Chinese tastes and Chinese stories. But that's for tomorrow's film execs to contemplate. Today, Chan's images rattle in the mind: a distraught Lin wading through his midnight-green hotel pool; Nie and Sun in a darkened theater, silhouetted against a screen that has gone as blank as their relationship; Sun and Lin on a frozen lake, wrapped in a decade of love and hate. And crimson stage blood staining stage snow, as bright as the future of film in China.